By default, fatal, error-level errors, and warning (non-fatal) errors are captured in the log files, indicated by the True value. Additionally, API calls and Database calls that take longer than 3 seconds are written onto the log. To adjust logging settings, update the settings found in thesettings.xml	file. View the logs in the Primary	.log	files. These instructions assume that the platform is installed in its default locationC:\Program Files\Decisions. Use your installation location when following these steps. Begin by changing the logging settings in the settings.xml	file. 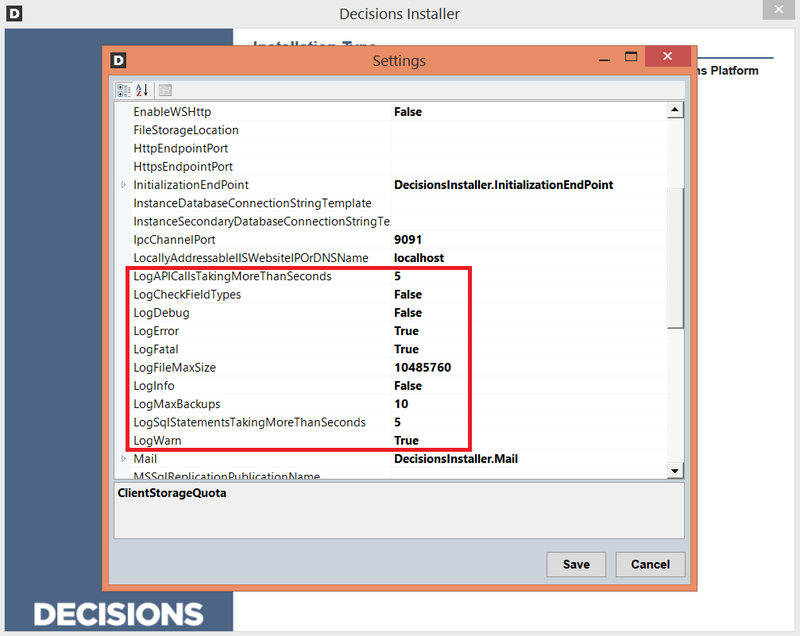 Open the Decisions installer and click Edit Settings	. OR, navigate toC:\Program Files\Decisions\Decisions Services Manager	and open the settings.xml	file. By default, fatal, error-level errors, and warning (non-fatal) errors are captured in the log files, indicated by the True value. Fatal and error-level errors are also logged as Windows events for monitoring by external tools. Then, change the value to the respective time interval. For example, to capture all SQL statements and/or API calls taking longer than 1 second, replace "3" with "1". To log informational errors and errors encountered in the flow Debugger, change the logging level by locating these lines. . .
. . . and changing the value from "false" to "true" for each. Enabling debugger logging makes it possible to see which steps take the longest time, but be warned: logging at these levels will dramatically increase the size of log files over time, and negatively impact performance. These levels should only be turned on when necessary for troubleshooting, or for demonstrations	. Save and close the settings.xml	file. Once we restart the Service Host Manager	, these changes will take effect and logs will be generated automatically. Open Services, select Service Host Manager	, and restart the service. To view the logs, navigate toC:\Program Files\Decisions\Decisions Services Manager	and open the fileLogs\Primary	. When sending log files to Decisions Support, this typically is the file that should be attached.